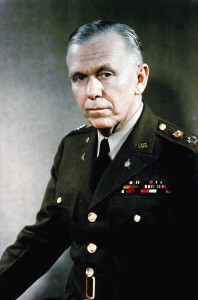 Marshall was chief of staff of the U.S. Army—the senior officer of the army. After the war, he served Harry S. Truman as secretary of state During World War II – 1947-1949 and then as secretary of defense (1950–1951). While he was secretary of state, Marshall collaborated on and championed the European Recovery Program—a massive U.S. funding of postwar recovery—which was popularly known as the Marshall Plan. He was recognized in 1953 with the Nobel Prize for Peace —the first former professional soldier to be awarded the prize.